Preparing for the upcoming school year, as district-wide classroom budgets seem to get smaller and smaller, is an expensive endeavor. Luckily, it doesn’t have to be. That is, if you know where to go for the most affordable school supplies, classroom decorations, and more. Instead of walking into your local Michael’s (We love that store as much as you! ), head online because you don’t want to miss these prices. The following websites (some that you use for your personal purchases, like Amazon, in addition to other lesser-known websites such as Oriental Trading Co.) will help you save on everything for this back-to-school season. Amazon – Amazon has a lot to offer teachers of all grade levels. Everything from office supplies to furniture to books, all in one place. You can also access affordable technology on Amazon, including Kindles and eBooks, video projectors, and computer accessories. What’s more, sign up for Prime membership ($99/year) and you’ll skip the shipping costs and get what you need in two days. Now there’s no reason to have a melt down on the first day of school because you forgot something important; just order from Amazon Prime and it will be there by the end of the week. By the way, if you shop at Amazon and name TCEA as your charity, Amazon will donate a portion of its profits to us at no cost to you. Just go to smile.amazon.com and order as you normally would. There is no additional charge or fee to you. Please consider helping support TCEA in innovating teaching and learning! Books and Magazines: Get discounts from Barnes and Noble, Books-A-Million, Scholastic, and a variety of magazines, which are perfect for non-fiction classroom reading. Paper and Craft Supplies: Look for coupons for online shopping at Hobby Lobby, Michaels, and Office Max. While you may have these in your town, you’ll save time by not having to go into the store. Classroom Posters: Coupons from Vistaprint and HP will make it cheaper for you to create and print your own posters. Oriental Trading Co. – This craft website has an entire section for “Teacher Supplies” where everything is sorted into categories such as Bulletin Board Supplies, Reading Corner, Classroom Decorations, and Dry Erase. There’s also an area dedicated to awards and incentives, with a variety of cards, certificates, trophies, and ribbons to purchase for classroom contests and projects. And, if you have a toy chest, you can fill it on the cheap by shopping in bulk, which this website also offers. Oriental Trading Co. has a 110 percent lowest price guarantee policy and discount incentives for referring friends. They also offer daily discounts to save on shipping so you can be sure to get the most bang for your buck. Teacher Storehouse – While classroom decorations are not more important than books and supplies for students, you may have no choice if your school requires them; you’re probably familiar with the mandatory wall and bulletin board decorations for the first day. Save money on yet another year of DIYing your decorations by shopping with Teacher Storehouse, which offers a variety of necessary craft items: borders, charts, banners, maps, letters, and more. You’ll also find games, office supplies, arts and crafts, and teaching materials for a great price. Take advantage of weekly sales and clearance items and enroll in their loyalty rewards program to save even more. 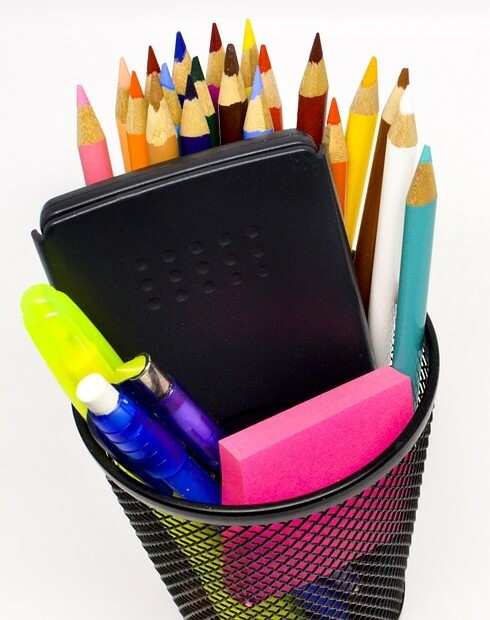 Vicki Davis, the Cool Cat Teacher, offers some great tips for saving on school supplies at Staples. She also includes some excellent ways to find funding to help pay for those needed items. And, if you’re a Texas teacher, don’t forget about the Sales Tax holiday on August 5-7. As in previous years, the law exempts most clothing, footwear, school supplies, and backpacks priced less than $100 from sales and use taxes, which could save you about $8 on every $100 you spend. Details on the holiday are available here. Whether it’s your first or fifteenth year teaching, don’t stress over spending to get your classroom ready for fall. Use your innate teacher resourcefulness to find the best deals available and you’ll have the best room on the hall at the very best price. Do you have other great places or ways to save on back-to-school supplies? Please share them with our readers in the Comments section below! Jessica Thiefels is the editor of Whooo’s Reading and an education blogger who’s been featured in publications such as PBS.org, EdTech Digest, and Daily Genius. Her favorite books growing up were My Side of the Mountain and The Giver, and she hopes to inspire a similar love of reading in students and educators.